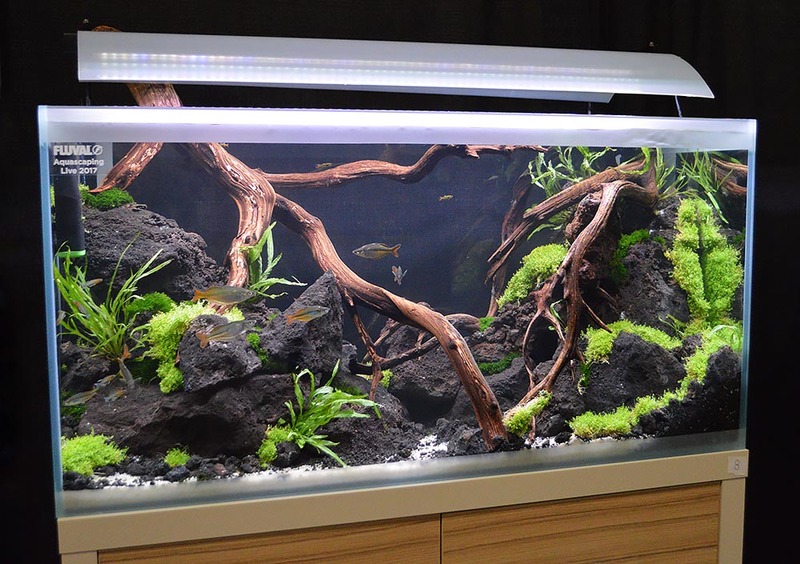 A gorgeous entry in the 2017 Aquascaping Live! 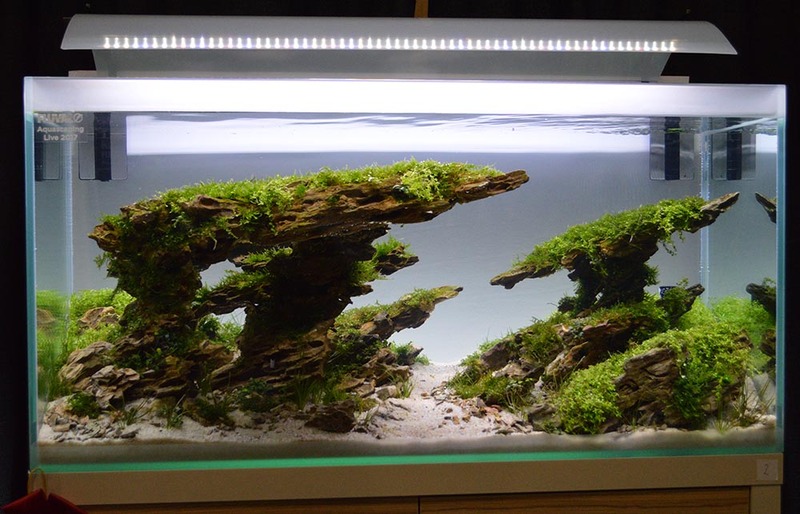 large tank competition; this aquascape was created by Phil Kerewich and Jake Zucker. 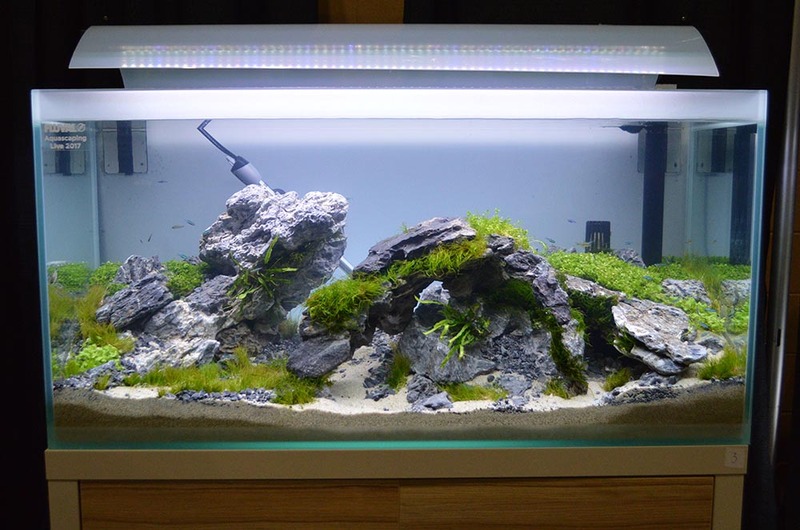 Turning our attention from the 2017 small tank aquascaping competition, the Aquascaping Live! large tank competition, held in early November at the Aquatic Experience – Chicago, once again saw the bar being raised year-over-year. As with years prior, this contest requires an application to compete, with teams of 2-5 people eligible for consideration. 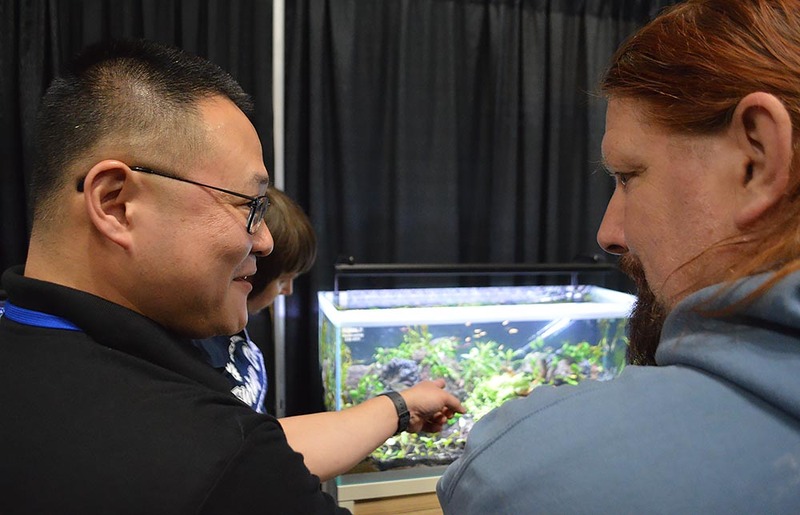 Bailin Shaw (left) and Randy Peterson (right), discussing the entries in the 2017 Aquascaping Live! competition at the Aquatic Experience, Chicago. While the small tank competition is an “every-contestant-for-himself/herself” foray which anyone can enter, working in concert and doing so in a larger format requires careful teamwork and organization. Crowds milled around the entries all weekend, a testament to the interest in all things aquascaping and planted-tank these days. 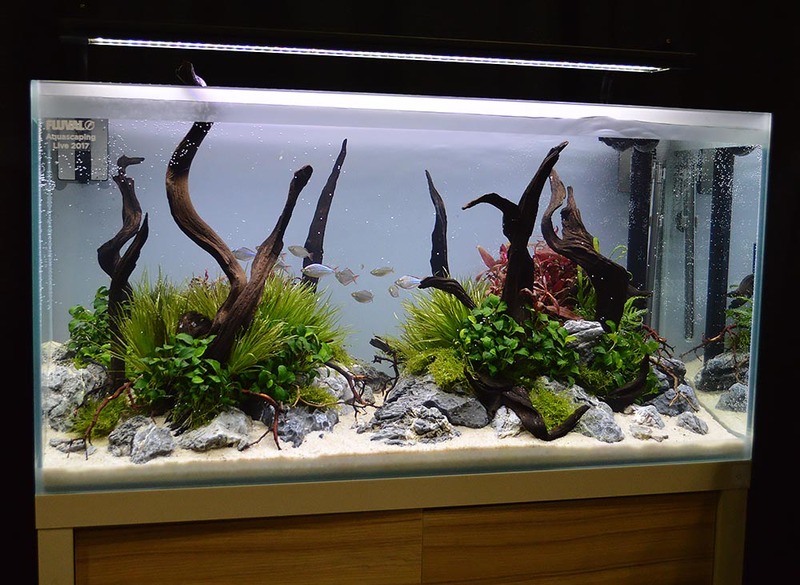 With dozens of talented aquascapers on hand, the event presented a unique format to learn from and collaborate with some of the best, in person and in front of a live audience. Combined with the family-friendly nature of the Aquatic Experience, and the draw it has with the general public, the Aquascaping Live! competition provides a tremendous opportunity to evangelize the “freshwater counterpoint to a reef tank” to the masses. 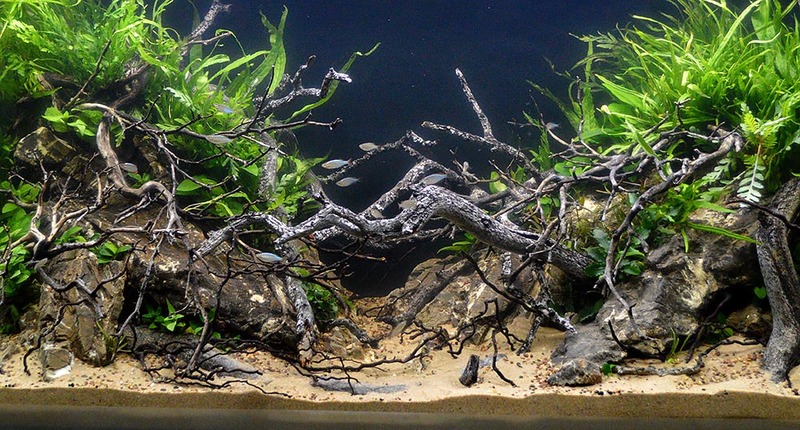 All the teams put their best foot forward in terms of creating a stunning planted aquarium on the spot. 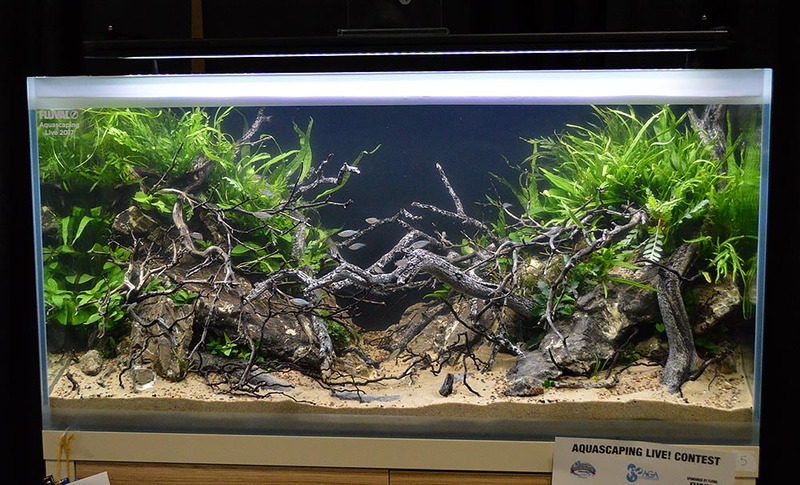 We hope you enjoy the 2017 entries, and please take a look back at our coverage of 2016’s Aquascaping Live! 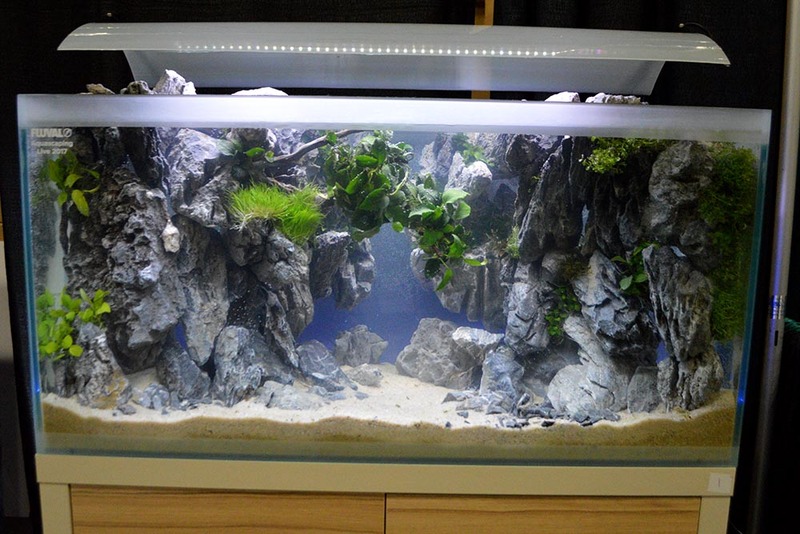 Large Tank Category for more insights on the rules, requirements, and opportunities presented to entrants by this Aquatic Gardeners Association–sanctioned event. With the Aquatic Experience moving to the Meadowlands Convention Center in Secaucus, New Jersey, to be held from October 17-19, 2018, we anticipate some shuffling and change-up as the location makes this unique contest available to a new region’s best and brightest aquascapers. The entry from John Pini, Marvin Lo, Vang Thao, Scott Miller, and William Romero took 2nd place. The entry from Jeff Miotke, Richard Valerio, Chuck Branch, Jerry Jobe, and Judy Prajitno Putra. The entry from Randy Peterson, Diana Peterson, Sean Stake, Rachel Kruse, and Pat Messer. The entry from Tyler Koch, Josilee Koch, Mike Bernard, and Jennifer Hayes. The entry from Cory Hopkins, Shawn McBride, Heip Hong, Art Commisso, and Bryan James took 3rd place. The entry from Michael Sizemore, Danny Adams, Lucas Bretz, and Han Tran. The entry from Kevin Kelly, Krystian Galazka, and Alex Forsythe. 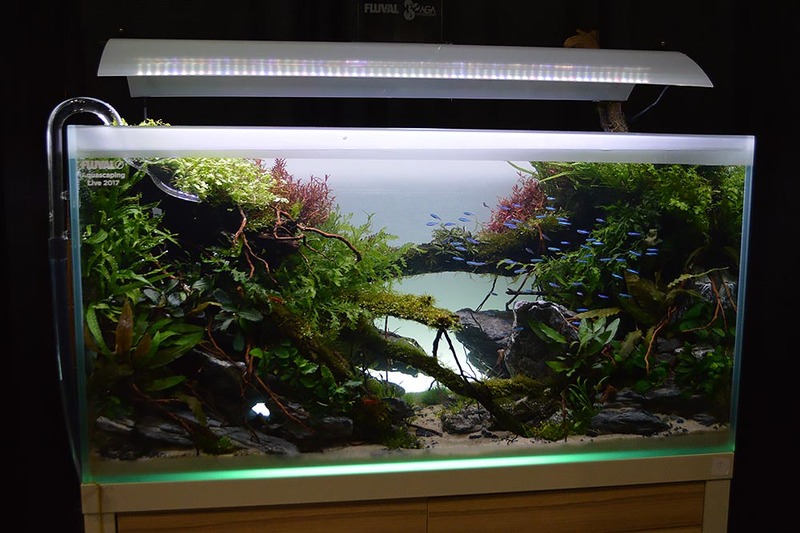 One more look at the entry from Phil Kerewich and Jake Zucker, which took the top spot in the 2017 Aquascaping Live! large tank competition. 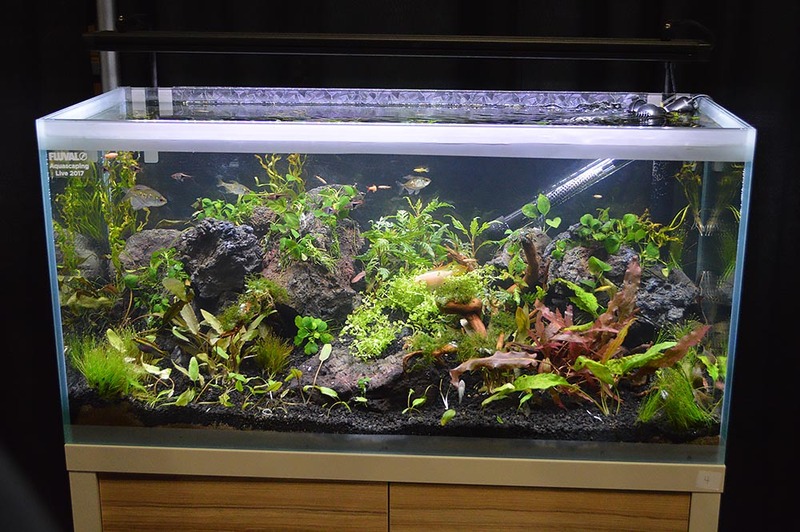 Be sure to also check out the small tank entries and winners from 2017.